Glenavon have completed the signing of goalkeeper Alan Blayney on a two-year pre-contract deal ahead of next season. Blayney moves to Mourneview Park from Linfield, although he has spent the last four months on loan at Ards. The Northern Ireland international lost his first-team place at Windsor Park last season following the arrival of Jonathan Tuffey. 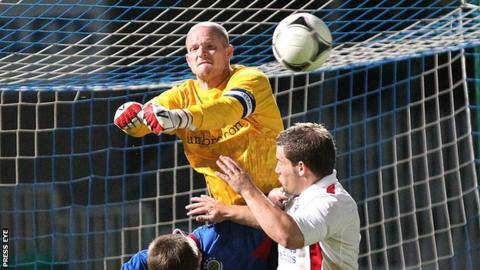 The goalkeeper has won three international caps and was named Ulster Footballer of the Year in 2010/11. Blayney played over 150 games for the Blues since joining in 2009, which followed spells at Stockport, Bournemouth, Oldham and Bohemians. Sean McIlhone has been deputising for the injured Andy Coleman between the sticks for the Lurgan Blues in recent weeks.